Around Halloween time, we start thinking about bones… Halloween skeleton bones, that is! Although to be honest, I’m not sure why most folks prefer to read books with skeletons just around the Halloween holiday. 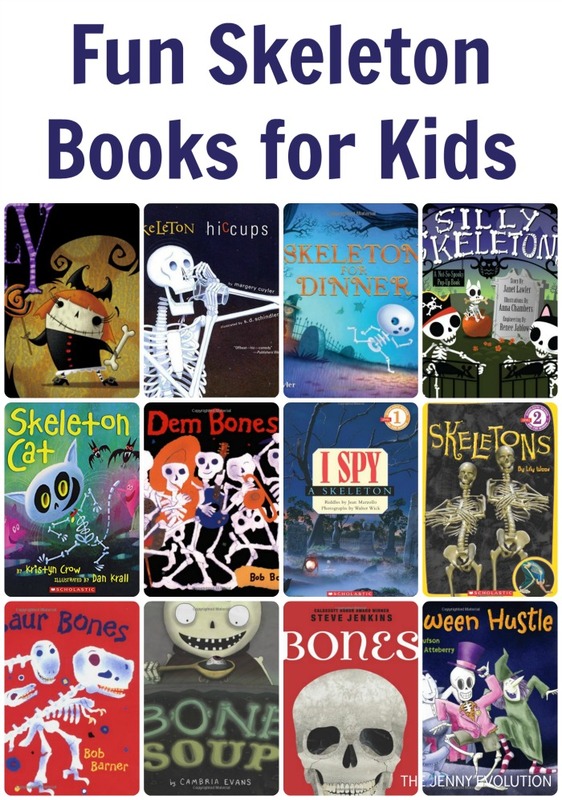 As the mom of boys, I think skeleton books are for all year round! 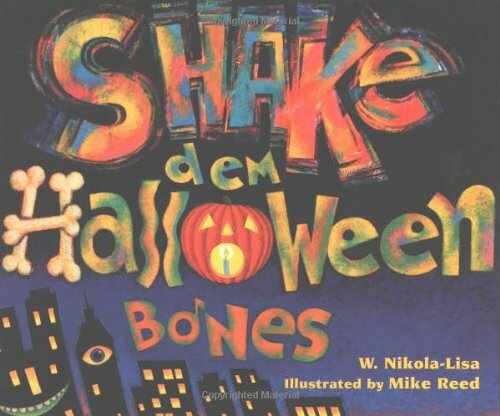 Shake Dem Halloween Bones: It’s Halloween night. The city is quiet. The city is still. But as the lights go down, the music comes up – and the guests start to arrive at the hip-hop Halloween ball! And oh, what a party it is. Told in hip-hop rhyming text, L’il Red Riding Hood, Goldilocks, Tom Thumb, and all of their fairy-tale friends come together for a rapping, stomping, shaking Halloween romp. Scoo-bee-doo-bee-doo-wah. Yeah! 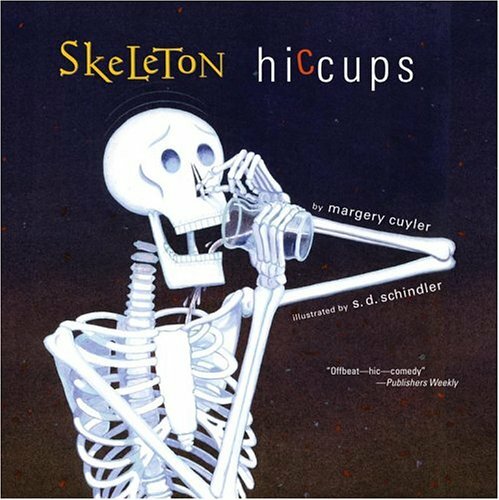 Silly Skeletons: A Not-So-Spooky Pop-Up Book: Join two Trick or Treaters and their faithful dog as they make their rounds on Halloween night. Are those really great costumes or are they real skeletons?!? This not-so-spooky Halloween pop-up book features movable scenes, pop-ups, and new friends on every page. Scholastic Reader Level 2: Skeletons: It’s easy to bone up on Skeletons with the relaunch of thIs Scholastic Science Reader–now with a new cover, photographs, and interior design. With brand new covers, updated photographs, and new interior designs, this series brings simple and fun information to beginning readers. In Skeletons, readers will learn what bones are made of, and just how many there are in the body. They’ll find out what each bone is called and why we just can’t live without them! 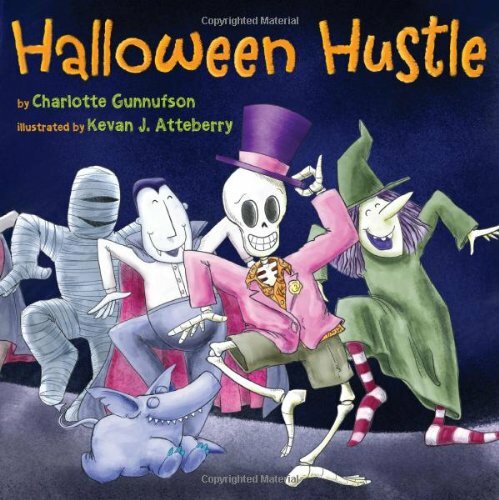 Halloween Hustle: In the dark, a funky beat. Something white with bony feet. Skeleton dancing up the street, Doing the Halloween Hustle. Skeleton is dancing his way to a Halloween party—but as he grooves across town, he keeps stumbling, tumbling, and falling apart! Can Skeleton stay in one piece long enough to make it to the party? Dem Bones (Avenues): Colorful torn paper collages bring to life this classic African American spiritual. 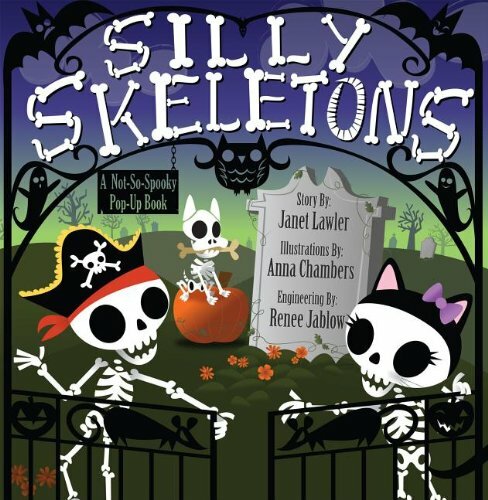 The frolicking skeletons will captivate children and adults while they sing along with this well-known, catchy song. 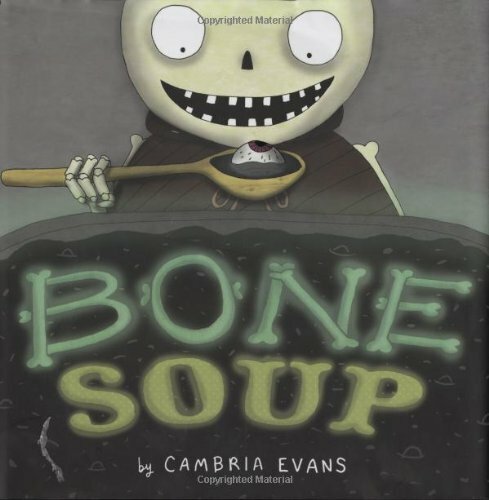 Accompanied by interesting, informative “bone facts” this book makes a wonderful addition to both home and classroom libraries and a fun treat for Halloween! The Skeleton Inside You (Let’s-Read-and-Find-Out Science 2): What does your skeleton do? Your skeleton helps you leap, somersault, and touch your toes—without it, you would be as floppy as a beanbag! There are over 200 bones living and growing inside you that make up your skeleton. There are also ligaments and joints that hold your bones together, and cartilage in your bendable parts like your ears and your nose. Learn all about what a skeleton can do—because this isn’t some make-believe Halloween skeleton, this is the real skeleton inside you. 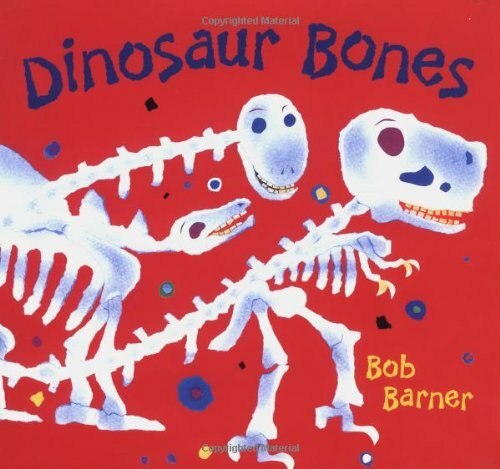 Dinosaur Bones: With a lively rhyming text and vibrant paper collage illustrations, author-artist Bob Barner shakes the dust off the dinosaur bones found in museums and reminds us that they once belonged to living, breathing creatures. Filled with fun dinosaur facts (a T. Rex skull can weigh up to 750 pounds!) and an informational “Dinometer,” Dinosaur Bones is sure to make young dinosaur enthusiasts roar with delight. Skeleton Cat: A spooky Halloween read-aloud guaranteed to tickle the smallest funny bones! After nine lives, Skeleton Cat is back for his tenth. And he has big dreams: to be a drummer. So he rattles and shakes his way through town to find the perfect band. And this phantom cat cause quite a hilarious scene. 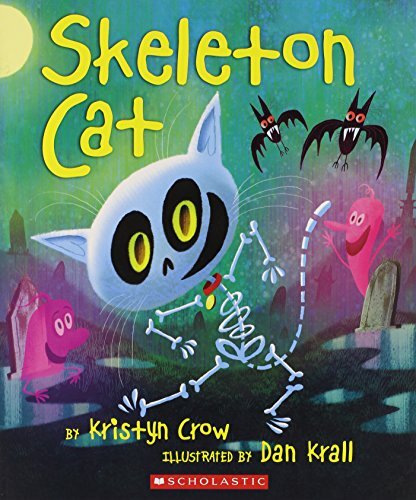 Kristyn Crow’s punchy beat, rollicking action, and clever rhyme paired with Dan Krall’s ghoulishly charming art makes Skeleton Cat a perfect, catchy read-aloud for all ages. 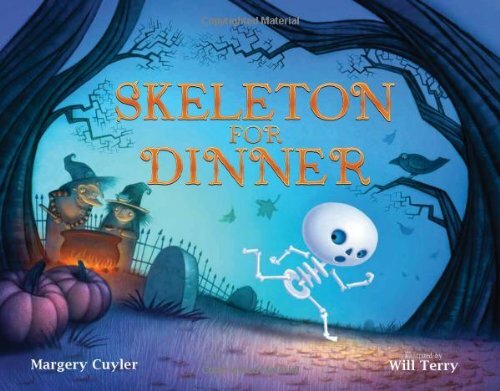 Skeleton for Dinner: Big Witch and Little Witch have made stew, and now they want to have their friends for dinner! But when Skeleton mistakes the guest list for a menu, he takes off running, and soon Ghost and Ghoul join him too! But poor Little Witch has no idea there’s a misunderstanding. Luckily there’s one creature in the haunted forest who can help everyone figure it all out. 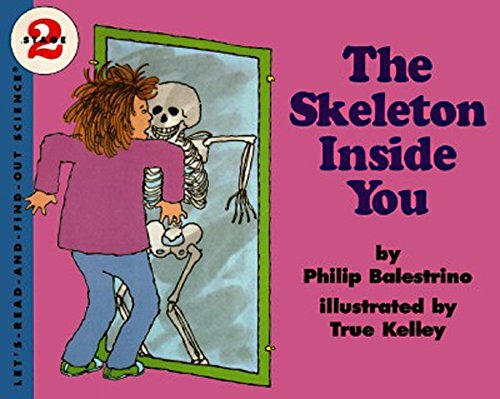 Skelly the Skeleton Girl: Skelly, a little skeleton girl, finds a bone one day. Who could it belong to? As Skelly searches for the bone’s owner, she questions everyone from her skeletal goldfish, to her man-eating plants, to the monster who lives beneath the stairs. Finally, Skelly locates the bone’s owner–and makes a new friend. 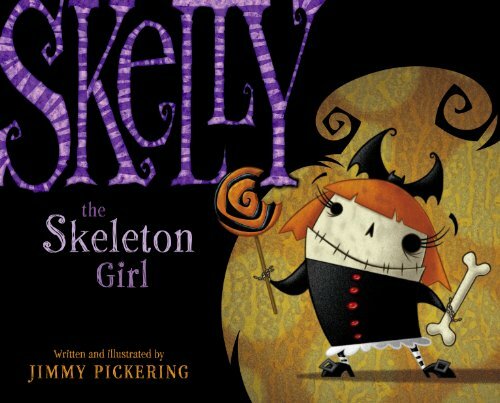 Rising talent Jimmy Pickering has created a mildly spooky and totally original cast of characters who populate Skelly’s Tim Burton-esque world. 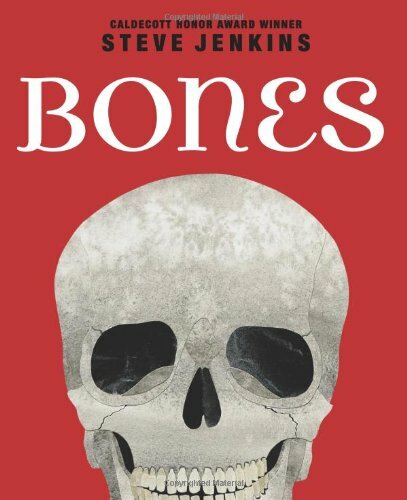 Bones: Skeletons and How They Work: Caldecott Honor winner Steve Jenkins presents a fascinating look at the bones of the human body as compared to the bones of animals, and shows them off! This book is far from skinny — it’s the definitive nonfiction title about human and animal bones, delivered with in-your-face accuracy and intrigue. 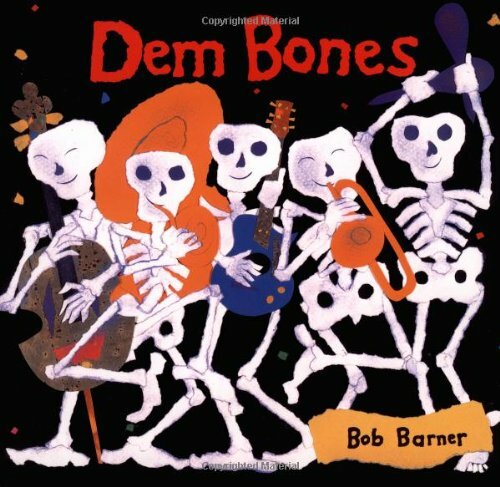 In this visually driven volume, kids come face-to-face with some head-to-toe boney comparisons, many of them shown at actual size. Here you’ll find the differences between a man’s hand and that of a spider monkey; the great weight of an elephant’s leg, paired with the feather-light femur of a stork; and rib-tickling info about snakes and sloths. How many bones are in the whole human body? 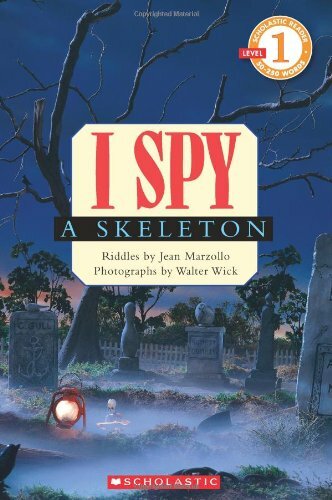 I Spy A Skeleton: The bestselling I Spy Reader series continues with this spooky search and find! All new, easy-to-read spooky riddles by Jean Marzollo are paired with fun I SPY photographs from Walter Wick to create an I Spy easy reader that’s perfect for Halloween! 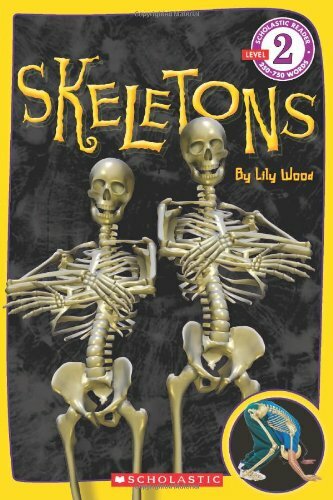 Like these skeleton books for kids? Find even more engaging book lists for kids with more than 100 book-themed reading lists! There’s also The Aviator Owls and the Dancing Skeleton! Cute characters and it donates money to a good cause.